Like little birds waiting on a worm, my sister Margaret Ann, housekeeper Sara, and I had watched the vine behind the wild plum thicket grow tiny white flowers. 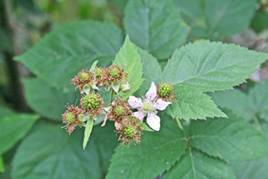 As the weather became warmer, the tiny flowers had turned into small red berries, and then into large blackberries. They were finally ready, and now it was time to pick them. So, swinging my bucket in one hand and holding Sara’s hand with the other, we worked our way into the thicket and back into the sunshine to reach the berries growing on the old farm fence. We picked and picked the sweet ripe blackberries until our bucket would not hold another berry. And home we went to make blackberry cobbler. And, I am still making it 50 years later. Enjoy this old timey recipe, and in addition, the one below for Strawberry Shortcake. Melt the butter in an 8 x 8 or equivalent size baking dish. Mix sugar, flour and buttermilk together. Pour the batter over the melted butter. Do not stir. Place blackberries in a bowl and top with 3/4 cup sugar. Spread blackberries on top of batter and pour over any leftover sugar from the bottom of the bowl. Do not stir. Bake for approximately 50-60 minutes or batter is firm. When I think of strawberry shortcake, I think of deep red, deliciously ripe berries that are just oozing with juice, spooned over sponge cake. And if my mother were making the shortcake, the berries would have a little vanilla ice cream on top and more berry juice would be spooned over the ice cream, and then the whole thing would be crowned with deliciously sweetened whipped cream and another berry on top! Good gracious, how can you get more decadent than that? Mix sugar and shortening and blend well. Add eggs, beating thoroughly. Add vanilla. Add milk and flour, alternating between milk and flour. Place batter into 2 greased and floured 9-inch cake pans and bake until firm and golden brown, about 15-20 minutes in a 350º preheated oven. Check for doneness with a cake tester or toothpick. Set layers aside to cool completely. Add the ½ cup sugar to the 3 cups sliced strawberries. Set aside or place in the refrigerator until ready to use. Add 3/4 cup sugar to the 3 cups mashed strawberries. Beat the cream until frothy, add the sugar and vanilla and continue beating until stiff peaks form. Place the first cake layer on a deep cake plate or platter. Spoon ½ the mashed strawberries on the cake layer. On the edge of the first cake layer place some of the sliced strawberries so that when the second layer is added these slices will be peeking out. Place the second cake layer on top and spoon the remaining berries on this layer. Add a layer of sliced strawberries to the top layer over the mashed berries. Mound sweetened whipped cream in the center. Top with several whole berries. Use the remaining cream to put on the plate with individual servings.